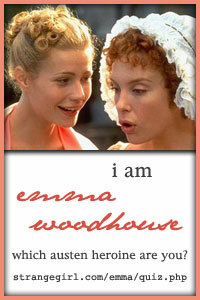 You are Emma Woodhouse of Emma ! You like being the queen of your social circle (small and provincial as it may be), and feel it's your duty to help those less influential than you. You often meddle in the affairs of others, though you do it with a pure heart. You are often deluded in your flights of fancy, but your good intentions and creative spirit make you someone anyone could like.